They say the grass is always greener on the other side, but they didn’t mean on the other side of your fence! If your neighbor’s lawn is lush and green but you can’t quite get yours on par, it might be because you don’t have the right lawn care tools to work with. 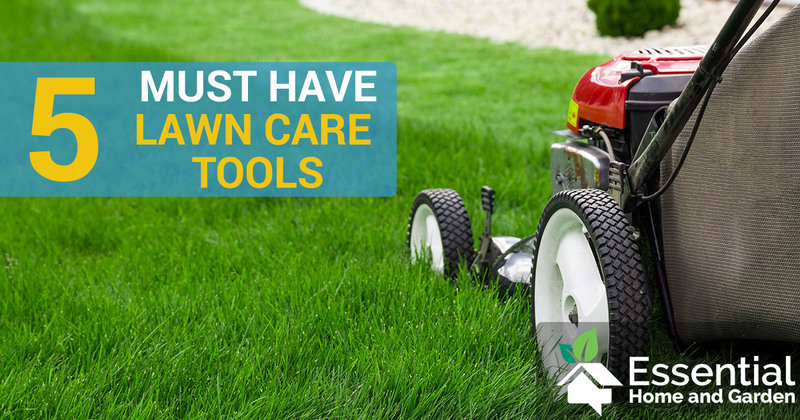 When it comes to lawn maintenance, there is no single tool that can do it all. This is because there are a ton of different aspects of landscaping: weeding, edging, grass cutting, fertilizing and more. 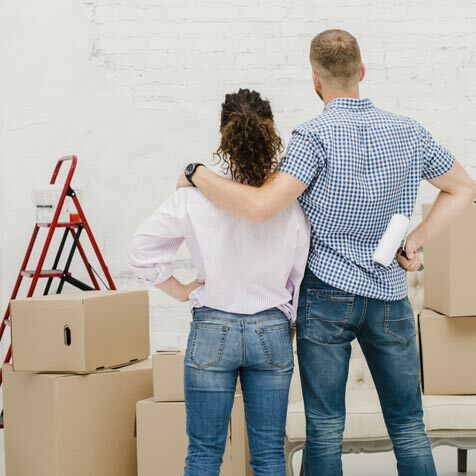 Fortunately, with the right arsenal of lawn care tools you can tackle most jobs yourself without needing to fork over the money for landscapers. Below are 5 essential types of tools for growing & sculpting the perfect lawn. With a combination of the right tools, knowledge, and patience, you too can have a lawn that makes others green (like your new lawn!) with envy. The lawn mower is perhaps the most important tool when it comes to lawn maintenance. It allows you to keep your grass the same length throughout as well as cut down any dandelions or other weeds sticking up. See our guide on how to get rid of dandelions. The majority of the time you will spend on your lawn will be cutting the grass, especially for those with larger yards. It can also be the most physically demanding task, particularly when the sun is blaring down on you. Fortunately, by choosing the right lawn mower you can drastically cut down the amount of time & effort spent on your lawn without sacrificing the end results. That decision begins with choosing to use a mulching mower. What is lawn mower mulching? Simply the best way to cut your workload in half. A mulching mower will chop down pieces of grass into very fine bits, allowing it to be deposited back into your lawn as you mow. This way it can fertilize the grass naturally, saving you the time and money of buying fertilizers and spreading it manually. 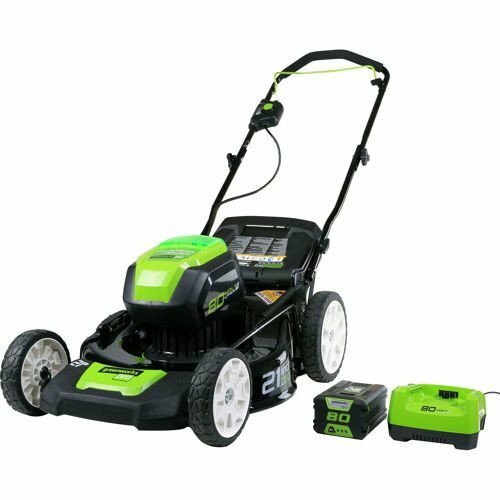 Whether it’s a cordless mower, or gas powered – make sure you get a good quality lawn mower. There are 2 things that every lawn needs: sun and water. Unfortunately, you can’t harness the power of the sun just for your lawn or control the weather to make it rain when you need it. However, you can keep your lawn hydrated with a hose or sprinkler system while you wait for the rain to fall. According to Scott’s, your lawn will need about an inch of water per week on average to remain perfectly hydrated, or about .63 gallons per square foot of grass. If you have a sprinkler system, congratulations! You can simply check your sprinkler’s flow rate to tell you how long to leave the system on for optimal hydration. If you’re stuck watering by hand or had rain recently, you can perform the “screwdriver test”, where you take a screwdriver and put it into the ground until it hits 6 inches deep. If that layer is wet after rain, your whole lawn is likely hydrated. However, if it isn’t wet enough, you will have to water it manually with a hose, testing individual sections as you go. There is no precise science to manually watering your lawn, so you’ll have to go through trial and error until you have an idea of how long you need to spray for 6 inches of water penetration. Heavy Gauge Power Coil. 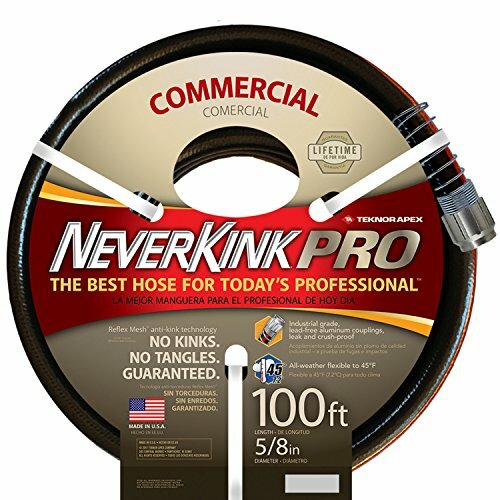 This hose comes in 5/8th" and 3/4" diameter and is available in 50', 75' and 100' lengths. Despite its best efforts, there are parts of your lawn that your mower simply can’t reach effectively. 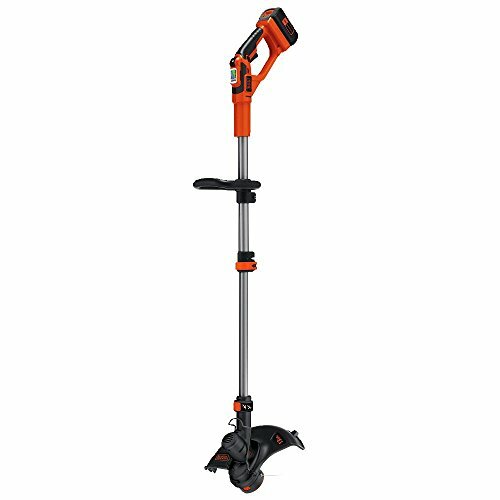 The edges of driveways, near flowerbeds & gardens, and tight areas require a smaller and nimbler tool to trim down grass and weeds for those finishing touches to your lawn. An edger will use a string of hard plastic that is powered by a gas or electric motor to chop anything in its path (including you if you aren’t careful). With it, you can bring the unruly parts of your yard in order. You can edge grass so it doesn’t reach over into the sidewalk, cut down the grass too close to your fence, and more. If you’re trying to bring a dead or dying lawn back to life, you’re going to need a little bit of extra help on top of just your mulching mower. Lawns can often develop dead or bare spots if they are not watered properly, have something blocking the sun, or are a victim of your dog’s bathroom habits. They can also become thin from sun damage, cold weather, or a lack of water. 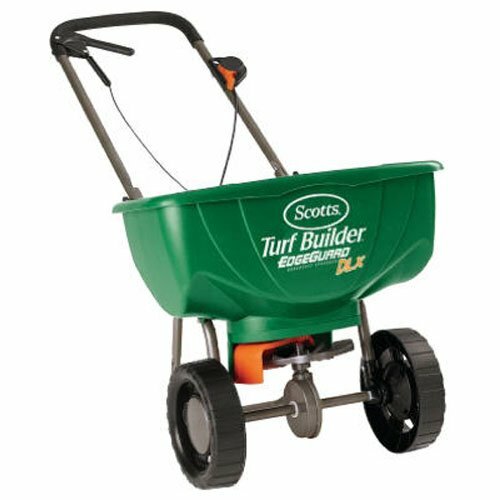 With a fertilizer spreader, you can roll back time on your lawn. If your lawn is patchy and needs more grass, you can put grass seed in the spreader and disperse it over your lawn. If your grass just isn’t thriving because of your environment, you can load it up with fertilizer to spread it evenly, helping your grass grow. If you’ve got trees on or near your yard, you’ve probably experienced been overrun by Fall’s gift of raining leaves. While these leaves can be beautiful at times they also die easily, leaving your beautiful green grass that you’ve worked so hard on covered by brown death. This is where rakes and leaf blowers come in. 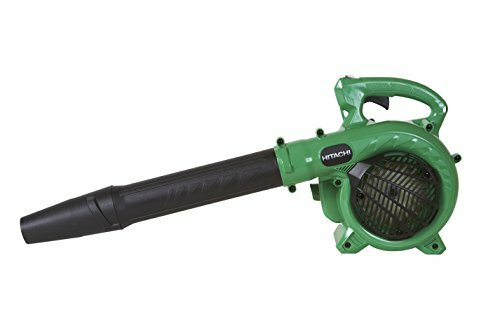 Check out our guide on the best backpack leaf blowers. You want to see your grass shine, so you’ve got to clear out the leaves & you sure aren’t doing it by hand! The old-fashioned method involves a rake with teeth that grab and pull the leaves as you sweep them into a pile to be disposed of. You can also use a gas or electric-powered blower to blow the leaves into a pile, praying that your children or dogs don’t jump in and send the leaves back across your lawn before you can bag them up. Now that you know what you need to build a healthy and beautiful lawn, you can assemble your arsenal of lawn care tools to start making your neighbors jealous. Remember that sculpting the perfect lawn takes time and effort, but with the help of the right tools you can become a lawn care pro in no time.